The upcoming performance of the Fauré Requiem, December 3, 5 and 6, is just the latest in 39 years of music-making between the Seattle Symphony and the Seattle Symphony Chorale. Recently these incredible combined forces have taken on masterworks such as Mahler’s Symphony No. 3, Ives’ Symphony No. 4, Bach’s St. Matthew Passion, Verdi’s Requiem and Benjamin Britten’s War Requiem. Perhaps you’ve seen these performances on stage and wondered how the works are chosen? Or who the stunning, dedicated vocalists are in the choral risers? Maybe you’ve even wondered how to join them! We cannot talk about the Seattle Symphony Chorale without talking about its dedicated and passionate conductor, Joseph Crnko. He prepares this all-volunteer chorus, often weeks or months before their first rehearsal with the orchestra, finding creative ways to structure the process, taking into account the busy lives of its members. Fauré’s Requiem won’t be your only opportunity to hear them this season. December will also feature the annual performances of Handel’s Messiah and Beethoven’s Ninth Symphony. They will be heard in Morton Feldman’s beautifully subtle Rothko Chapel in February as part of the [untitled] contemporary music series, then in Szymanowski’s Symphony No. 3, Op. 27, The Song of the Night in April and Stravinsky’s Symphony of Psalms in June. 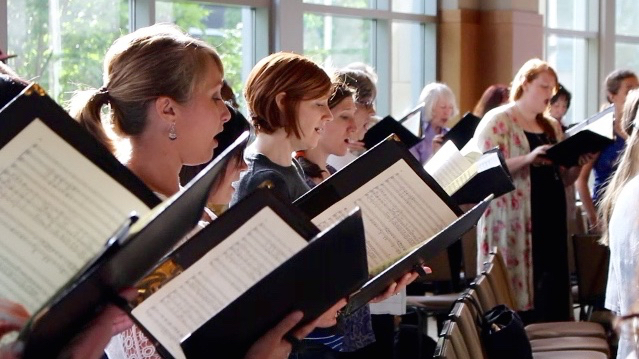 Chorale Auditions: The Seattle Symphony Chorale welcomes new members. Please review the audition requirements and fill out an application here.